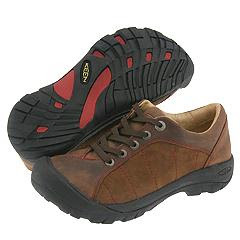 Then there's that joke about only wearing comfortable shoes. . . . Keens offer comfort AND style and are a necessary element of any good lesbian's wardrobe. My own story about wearing comfortable shoes is from a colleague and friend of mine. At the interview for my current job I practically harassed an African man in the group of interviewers about how he perceived life in the small Midwest town in which the university was located. I guess I was just trying to get a feel for how a minority dealt with the life that the city offered. The (now) colleague/friend of mine told me later that he recognized immediately what I was doing and brought this up to the department later during their discussion of the candidates. He worried that I wouldn't want to live in the small town as a lesbian. The rest of the department was appalled that he would make such an assumption. He replied something to the effect that he was certain of my sexuality/sexual-orientation because of my 'comfortable shoes' in the interview! By the way, they were not, in fact, Keens. de-lurking to say I so love Keens. And the pair you posted have been on my feet all winter. Hello brigindo! You have EXCELLENT taste! Hahahaha....I was going to suggest Birkenstocks and wool socks. I guess that is too 1990's in Lincoln, NE. How about Ellen? She's my 3rd favorite lesbian. Keens are the new Birkies! At our house we too love the Keens! But you failed to mention how much we love to put them on our little people (doesn't Big have some too?)! Anyway -- yeah I was thinking of another spinoff:Stuff White People Like for their Kids. This would include Keens and They Might Be Giants Podcasts. Check it out on iTunes. They are free and awesome!